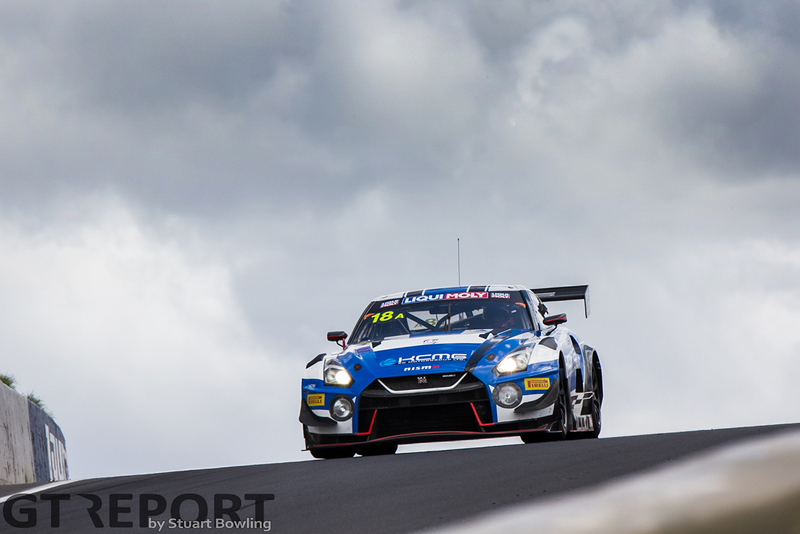 With a dramatic lap around Mount Panorama, Jake Dennis seemed to have won the Allan Simonsen Pole Position Trophy. The number 62 R-Motorsport Aston Martin Vantage GT3 pilot had the quick lap around the mountain all figured out: the Swiss team dominated all three qualifying sessions to set a final lap time of 2:02.4946. 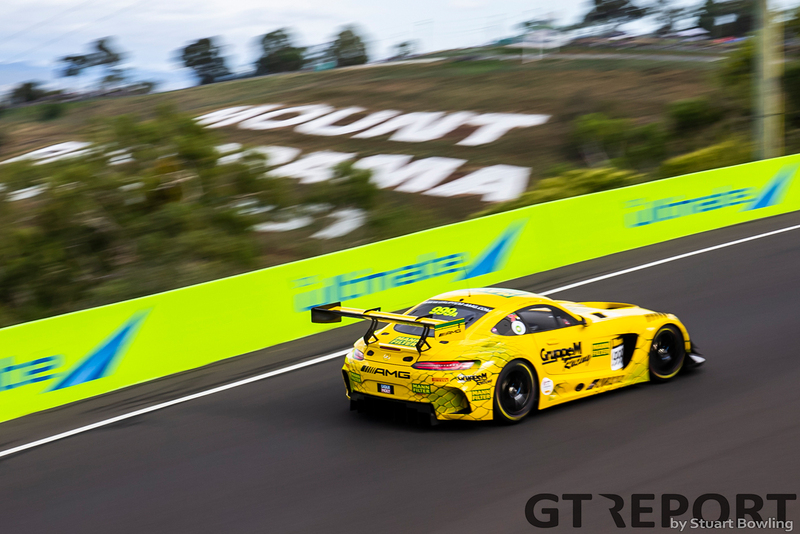 R-Motorsport’s glory was short-lived, however, as later in the evening the Aston Martin would be excluded from the results and the trophy handed to Mercedes-AMG Team GruppeM Racing (Raffaele Marciello/Maximilian Buhk/Maximilian Götz). 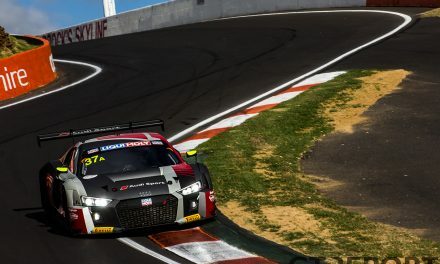 That R-Motorsport (Jake Dennis/Marvin Kirchhöfer/Matthieu Vaxivière) wouldn’t be starting from pole position for the race anyway, that they knew going into the Top 10 Shoot-out. A two-place grid penalty for speeding in the pits during the first qualifying session had made that impossible, but with the Allan Simonsen Pole Position Trophy, named after the eternal Aston Martin works driver who lost his life in Le Mans 6 years ago, still for the taking, Jake Dennis was determined to steal the lime light. 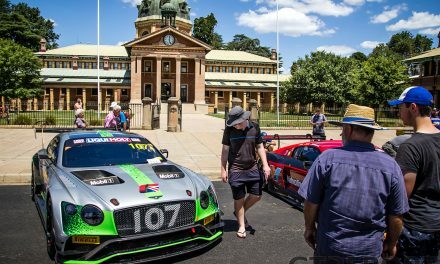 As he began his one and only shot at the trophy, the British racer hit every mark, meticulously steering the V12-powered machine through the narrow roads leading up and down Mount Panorama. 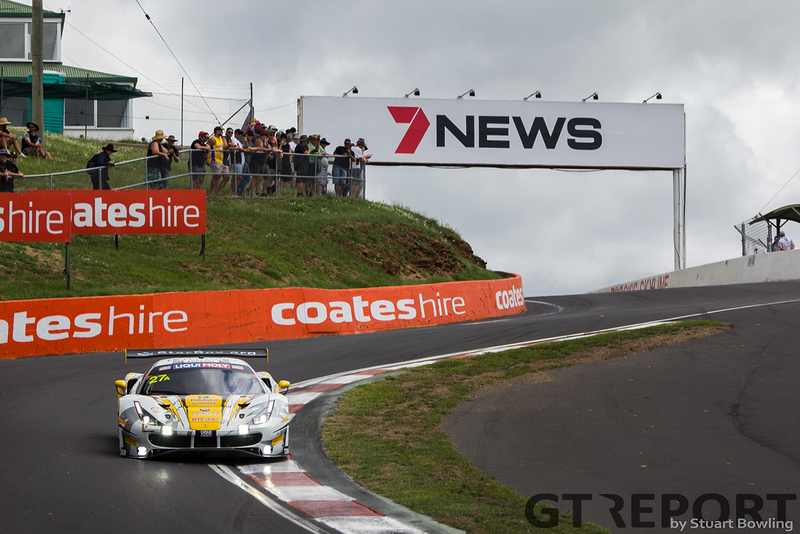 Raffaele Marciello held on to the top spot for much of the shoot-out, looking to regain the upperhand the GruppeM Mercedes-AMG GT3 team had on Friday. But in a session where the differences until then were mere hundredths of a second, Dennis put down a lap that was almost half a second quicker than Marciello’s. The contrast in style between the two stars of the past days could not be greater: Whereas Dennis wrestled the aging Vantage through the lap, nearly grazing the walls and kicking up dust to squeeze every last fraction of time out of it, Marciello seemed in full control of his current-generation GT3 as he calmly steered his AMG over the 6.2-kilometre race track. For the hours to come, R-Motorsport was the proud owner of the emotionally-charged Allan Simonsen Pole Position Trophy. But the glory wouldn’t last. In the course of the evening a fault in the mandated rev limit threshold was found by the scrutineers. Having already slapped the Aston Martin with a two-place grid penalty, exclusion from the Top 10 Shoot-out results was next, forcing R-Motorsport to start from 12th place. 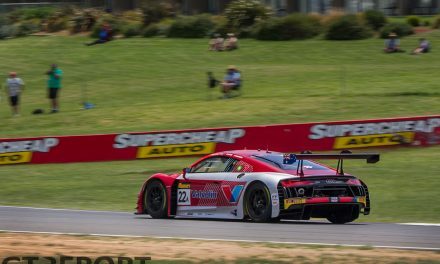 R-Motorsport’s loss was Mercedes-AMG Team GruppeM Racing’s gain as the Blancpain GT Asia regulars claimed not just pole position for the race, but the Allan Simonsen Pole Position Trophy as well. The second driver to set a time in the final session, Marciello stoot at the top of the charts with a lap of 2:02.9348 until Dennis came storming over the finish line. Mercedes-AMG GT3 compatriots Craft-Bamboo Racing/Black Falcon (Maro Engel/Gary Paffett/Luca Stolz) will line up alongside GruppeM on the front row, courtesy of a flying lap by Maro Engel who came frustratingly close to pole with a time of 2:03.0419. 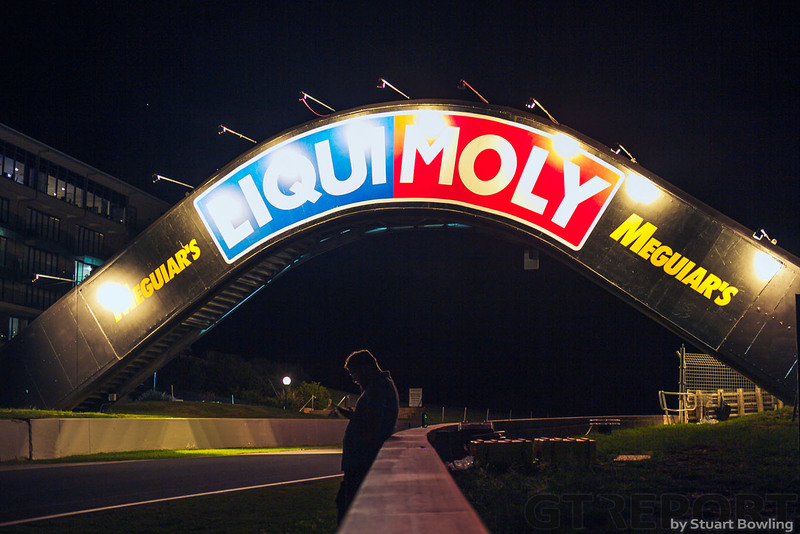 A short night now lies ahead for all competitors. 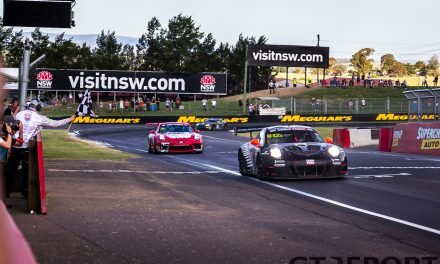 At 5:45 (19:45 CET Saturday evening) in the morning, when the sun is still to rise over New South Wales, the green flag flies for the Bathurst 12 Hour. With 12 hours of racing, nothing is lost yet for the stars of Saturday.